An official A.O.F.B. 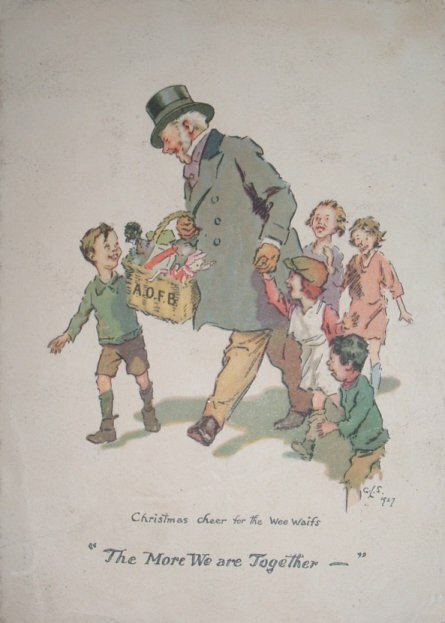 Christmas card was sanctioned in 1927, beautifully illustrated by G L Stampa. Produced by F T Goulding & Co. ( who also printed the membership handbook ). Advertisements placed in newspapers describe the card as "The Official A.O.F.B. Xmas Greeting Card, beautifully printed in 8 colours. Published at 6d . Available from Army & Navy Stores, Harrods, Selfridges, Whiteleys, W H Smith & Sons and bookstores and principal stationers."